Products that are transported by airplane must be packed well, but above all packed and fastened safely. Trip & Co is the right address for all types of tie down straps. 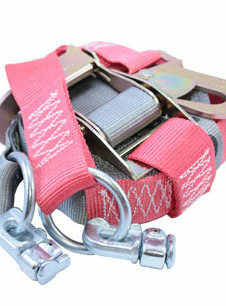 We offer you the best aircargo tie-down straps, net repair kits, oversize cargo strap covers and special size solutions, corner rope and lashing lines. We produce almost all the restraint products ourselves, guaranteeing best quality and swift delivery. The volume of tie down straps that Trip & Co produces and supplies worldwide makes us the best partner for all your straps. By using corner rope / lashing lines, you secure and fasten your pallet net over your cargo. Trip & Co supplies you a perfect lightweight airline cargo tie-down strap for which we only use top-quality webbing and hardware, accompanied by a Certificate of Conformance.